As someone who originally hails from the arctic depths of Minnesota, I’m no stranger to bone-chilling temperatures and perpetually dark and gloomy cloud cover. While I was growing up, the cold months were brutal, and seasonal affective disorder (SAD) was common. Though not immune, I was generally able to stomach the colder temperatures and ice-covered roads with less chagrin than some of my fellow Midwesterners. However, for a time right after graduating college, when life can feel especially messy and daunting, I struggled. Depression is a beast of all shapes and sizes, and since I fell on the milder side of the spectrum, I made the personal decision to resist my GP’s suggestion of a popular antidepressant and instead opted to try something more natural. Before doing so, I made an appointment with a well-known doctor who specialized in integrative and alternative medicine, and to say I learned a lot is an understatement. As it turns out, nature totally has our back when it comes to managing stress, anxiety, and mood. Whether you need a light mood boost or you’ve just been feeling uncharacteristically blue as of late, there are plenty of natural options for you to explore that don’t necessarily involve a prescription. Though, you should always talk to your physician before starting a new regimen. So if you're looking for a handful of our favorite, research-backed alternatives, read on. Ahead, seven natural mood enhancers our editors and favorite experts swear by. As noted above, more and more research is showing a direct link between gut and brain health. 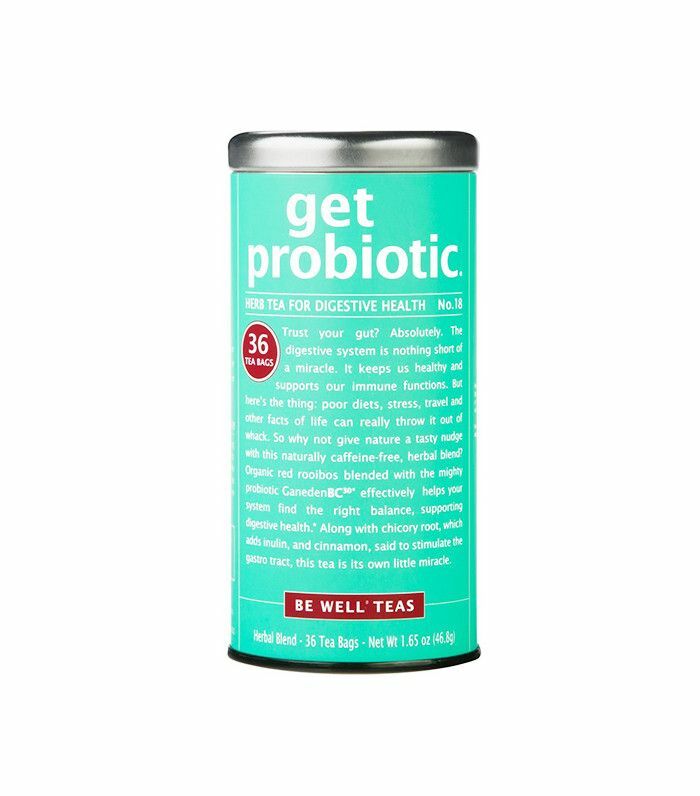 In fact, you may or may not have noticed that there is now an entire wall dedicated to probiotic-filled tonics and teas at most major grocery stores. The craze goes beyond strawberry-hibiscus-flavored bubbly and trendy fermented foods like kimchi and sauerkraut. Our gut houses billions upon billions of bacteria that actually wield quite a bit of influence when it comes to on our body’s mechanisms—especially our mood. Essentially, a happy gut (i.e. a lot of the good bacteria) equates to a happy mind, whereas an imbalance of too much of the bad stuff (which can be caused by poor lifestyle habits or a nutrient-poor diet) can take a toll on mental well-being. How to take it: Probiotic-rich foods (think fermented vegetables and low-sugar yogurt and kefir) and capsules (15 to 100 billion CFU count with at least 10 to 30 different strains of bacteria is optimal). If the thought of vitamin D automatically reminds you of your high school tanning habit, you’re on the right track (albeit a totally cringe-worthy one). Also known as the sunshine vitamin, vitamin D becomes a fat-soluble hormone that helps with the absorption of essential nutrients and minerals pivotal to mood and brain health. Plus—PSA—our bodies can naturally produce it. Since research has linked vitamin D and emotional health—and because so many Americans are deficient—it’s usually one of the first things a medical professional will test when a patient reports a not-so-sunny mood. How to take it: Liquid drops or capsules and a trip to St. Tropez (just remember to pack the SPF). In addition to making for a divine bath and bedtime routine, essential oils can also have an astounding effect on mood and stress levels. They can even gift you with an extra kick of energy! According to science, essential oils have been proven to effectively reduce anxiety and depression, and the reasoning is incredible. Since scents are intrinsically tied to our emotional responses and are directly carried to our brain, they can have a profound effect on hormonal balance and emotion (explaining our uncanny ability to detect a middle school boyfriend’s cologne from five miles away). You’re likely familiar with the calming effects of lavender and chamomile, but bergamot (fresh and stimulating) and ylang-ylang (mildly sedative) are other dark horses when it comes to natural mood enhancers. How to take it: Oils can be diffused or massaged directly into the skin. We don’t know many females who don’t pop one of these fatty-filled capsules on a daily, borderline-obsessive basis. (Maybe it’s an L.A. thing?) The supplement, which is most commonly worshipped for its skin, hair, and nail benefits, has reached cult-level esteem, joining the ranks of other such all-purpose saviors as coconut oil, dry shampoo, and a monthly subscription to SoulCycle. Recently, however, omega-3 fatty acids (especially EPA omega-3s) have also been linked to improved mood and cognition since they can reduce inflammation, improve blood flow throughout the brain, and normalize nerve cell communication. How to take it: Eat your healthy fats (think wild-caught salmon, chia seeds, walnuts, and grass-fed dairy and meat) and take your capsules (work with a doctor for correct dosage, but one gram daily of combined DHA and EPA is a good place to start, according to the specialist I saw back in Minnesota). I personally love these from Nordic Naturals. The mystical unicorn of medicinal herbs, this widely studied plant was once considered to have protective powers due to its unique homeopathic properties—and ever since Cara Delevingne told us she slathers it onto her skin, we believe. According to research, the flowering plant helps alleviate mild to moderate depression without the scary side effects associated with prescribed antidepressants. So what’s the rub? Scientists aren’t entirely sure how St.-John’s-Wort works in the disease’s treatment, though the most conclusive evidence suggests that it helps increase the availability of the neurotransmitters serotonin, dopamine, and norepinephrine to the brain, which in turn keeps us happy and healthy. How to take it: Capsules, teas, tablets, and topically via waters, lotions, and powders. According to research, B-6 and B-12 are the power couple of mood-boosting supplements. B-6 (pyridoxine) helps produce neurotransmitters like serotonin, while B-12 (methylcobalamin) naturally fights stress and supports neurological function—a natural match made in mood-enhancing heaven. How to take it: Capsules (a combination complex is best). Herbs are having a moment—especially those of the adaptogen clan like ashwagandha, Asian ginseng, and rhodiola rosea, which have a knack for helping the body adapt to stress and resist the fatigue that can precipitate depression. Used to target the adrenal system (aka the brain behind your body’s stress response), adaptogens have the chameleon-like ability to, you guessed it, adapt their purpose for your body’s particular needs. By naturally lowering the stress hormone cortisol, these herbs help fight fatigue, stress, and anxiety that can contribute to a melancholy mood. How to take it: powders and capsules. Note: If you think that you might be depressed, consult a physician or mental health professional immediately. Vitamins and herbal supplements may have side effects, contraindications, and may interfere with medications. Always check with your physician before using. Next up, self-care costs roughly $143,280 in a lifetime. Here's how to do it for free this fall. This story was originally published December 26, 2016, and has since been updated.